Now that spring is getting closer, it’s time to start getting your trees healthy and ready to enjoy the warmer weather and new leaves. There is more to getting your trees prepared for spring than just letting nature take its course. If you want them to be their healthiest and look their best, follow these tips. Check your tree for any noticeable damage or disease while there are no leaves on it. This way, you can see everything clearly. Take this time while it is still a bit cool to prune any unsafe or dead branches before the new growth begins, and while the pests and diseases are dormant. Remove any dead and severely damaged trees that didn’t make it through the winter and trim any fall plants that may have overgrown. Go through your yard and take the time to remove leaves leftover from autumn, any branches that may have fallen or broken off during the winter, and general waste and assorted buildup from the wintertime. This way, all of the plants on your property including your trees have a fresh, clean start to grow healthily. Brace any trees that may not make it through a storm and think about installing some kind of lightning diversion in the tree itself or on your property to protect older, tall trees. Plant any new trees you have acquired for the year once it warms up a little bit. Mulch around the new saplings to help control weeds and assist with maintaining ideal moisture levels in the soil. Add fertilizer at the same time you would to the rest of your lawn. As the trees grow leaves and the warmer temperatures and rainfall arrive, it is necessary to give them another inspection. At this point, you are checking to see if there is any standing water pooling around the base which could cause damage over time or any damage from flooding. Check for any colour changes, as this can also indicate a problem. You also want to be looking for any insects or diseases, as these can cause severe problems for your trees and can potentially spread quickly to other trees on your property or in your neighbourhood. If you do happen to notice anything out of the ordinary or find that your trees aren’t growing as anticipated, be sure to contact a qualified arborist to discover the heart of the issue, and help your tree grow healthy and strong. 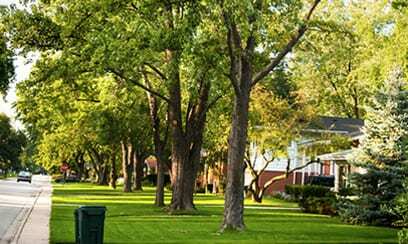 Call the tree care professionals at DreamWorks Tree Services today at 1-800-407-9917 or contact us online for assistance with all your spring tree needs. From planting new trees to add to your property, to pruning existing trees to remove unhealthy branches and increase the appeal of what is already there, our extensive tree services can cover everything you need to get ready for another year.